Will add 5.5 inches to over all length, weighs less than a pound and shooter ear friendly. Very easy to install. Just loosen one screw, slide over the end of the barrel and tighten the screw. New design will not scartch the barrel. Airgun use cold air not hot air like firearms and do not need baffles. DISCLAIMER: This product are INTENDED for the use on airguns only. It is a violation of Federal law to use this product in a manner inconsistent for which it was intended for. 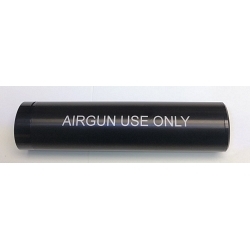 Read more on the court ruling between airgun suppressor and firearm suppressors. It is your Responsibility to know the laws in your state, county and city and to fully comply with them.